You have the choice between three search spaces. If you switch from KOBV search to Online Article search or to the German National Index, search terms are copied over automatically so that the results can be compared. You can search using simple search (all search fields are searched) or advanced search (selective combination of search fields). In the result list, search results can be further narrowed down by using different filters or facets (column on the left). 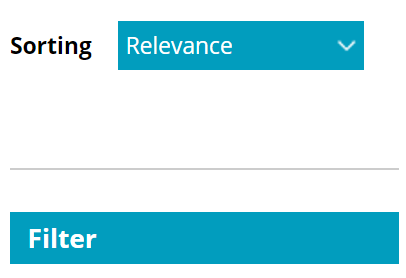 The result list is sorted automatically according to relevance. However, it is possible to configure another sorting method (e.g. according to year). In order to increase search results, you may use so-called wildcards to replace any number of characters. Use an asterisk * at the end of a word in order to search for all words containing this word stem. For instance, if you enter Ernährung* into the search field, you will receive results such as Ernährungsberatung or Ernährungsindustrie. In order to get results containing an exact sentence or phrase, use phrase search, i.e., surround the relevant terms by quotation marks (“…”). If, e.g., you search for ”Deutsche Forschungsgemeinschaft“, your results will only include hits with that exact phrase. Using Simple Search, all your search terms are automatically combined by the operator AND. In Advanced Search, you have the option next to each search field how you want to combine your search terms (AND/OR/NOT). In the menu under “Settings” certain values are preset. They can be modified and adapted. If you change the settings, you have to save them by scrolling down to the bottom of the popup-list and clicking “Save Changes”. Only then will your settings become active. At the bottom of the settings popup-list you will also find the “Bookmarklink”, which enables you to return to your settings at a later point in time, since the changes are otherwise only active during the time of your session. Your visit to the website of the KOBV-Portal is automatically captured by the web analyze tool Piwik. You can disable this function in the settings popup-list and save this setting. You can choose one or more libraries or all libraries in a region (Berlin, Brandenburg, national), and save the setting to narrow your search results. You can also select three national libraries that are not in the federal states Berlin or Brandenburg, but are members of the KOBV due to their stocks being of regional importance. Research in several hundred millions scientific articles, which are licensed in the KOBV libraries. Use the Mega-Index Primo Central as an access point for a search for articles, research data, congressional reports and more. The access to the medium may be restricted. You find information on this using the round blue circle with the white “i” which shows more information on the accessibility of the online resource on mouse-over. Option 1: There is an Open Access Button (Open Access Request). The Open Access Button is displayed individually or with variant 2 or variant 3 or variant 4 together. This button reports denied access to scientific publications and searches for free alternatives and also allows a direct request to the author for a free version. Option 2: There is a link to "online access". This link leads directly to the selected content and, depending on the licensing, allows direct access to the online resources or you get access via the campus network of the respective university or via VPN. Option 3: There is no link "online access" available. It is a licensed resource. The library portal can be reached by clicking on the linked library. You will receive access to licensed online resources in the campus network of the university or via VPN. Option 4: There is no link available. Have a look to the details of the resource for more information where the full text is contained. Enter the ISSN or ISBN or title of the work in the search slot of the rider "KOBV" to get access to the full text. The right column indicates if free online access is available. When searching for online articles, additional filters are available to narrow results. 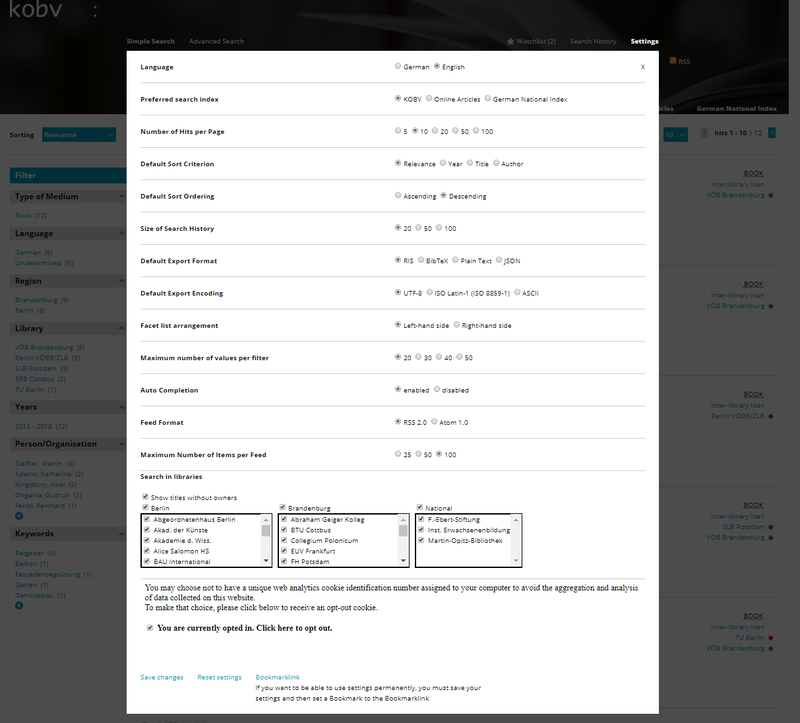 For instance, you can select a certain journal or source as filter. The KOBV portal offers open access for all users: It already identifies freely available documents with a logo and uses the Open Access button to connect the authors of a publication to get access the publication. The goal of the Open Access Button is the direct linking to the full text. If articles or records are not available, the authors can be contacted and asked to make their articles or data accessible. Users also have the opportunity to participate in existing inquiries to authors in order to convince them to make their publications and associated data freely accessible. Filtering for open access publications is currently not possible in the KOBV portal. Under the ”Availability“ tab of the individual results you obtain information on the exact location of the title. Click on the name of the library in order to be redirected to the relevant OPAC. By means of the “traffic light system“ you are able to see whether the title can currently be borrowed. GREEN: The medium is available. It can be borrowed in the library. YELLOW: This medium is part of the reference collection. It can be used on site, but may not be borrowed. RED: This medium is currently not available. It has either been borrowed or is not available for another reason. GREY: It is not possible to make a statement about availability. For further information, please refer to the library catalogue. 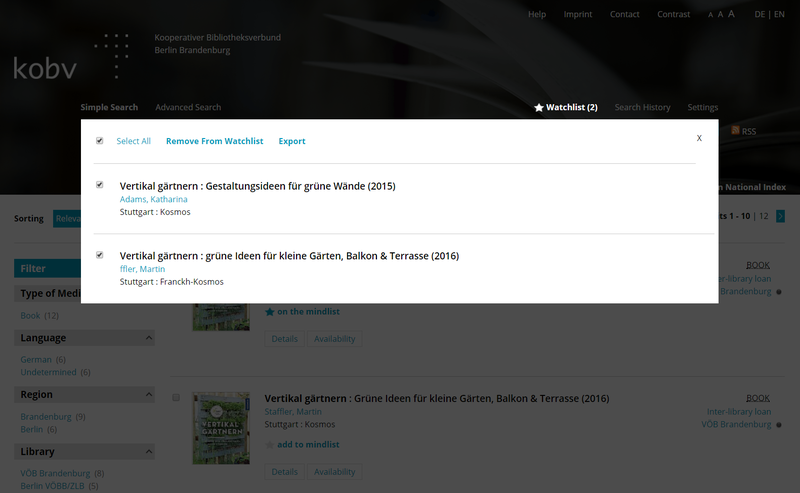 By clicking on the direct location, you will be redirected to the library guide (in German only) of the KOBV and will obtain further information such as address and opening hours as well as a map view. Selected results can be added to the watch list by clicking on "add to mindlist". With this you can create a list of relevant results, from different search queries. This is how the popup for the watch list looks like if no titles are selected (e.g. for the export). You can select all titles on the watch list by clicking “Select All”. You can delete selected titles form the watch list using “Remove from Watchlist”, or you can click “Export” to export them as a file or send them by email. 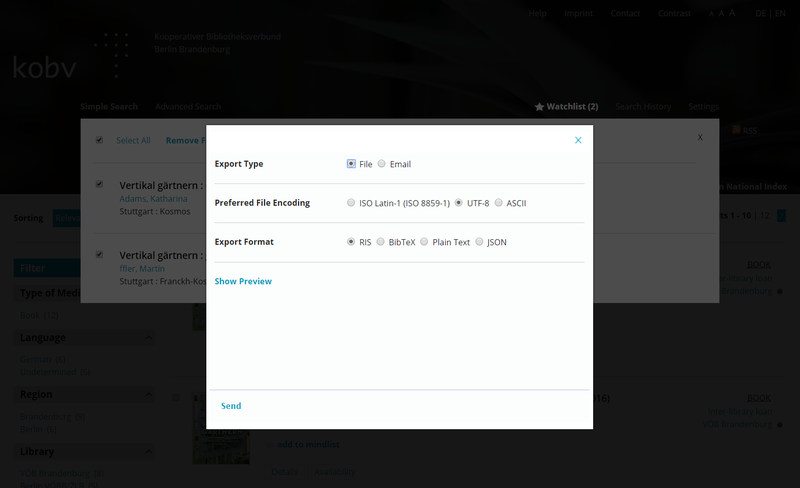 If you click “Export” you can also choose your preferred file encoding (e.g. UTF-8). Before exporting you can view a preview of the data. Selected titles from the result list, as well as titles from the mindlist, can be exported into a reference management system (e.g. Zotero, Endnote). Additionally, different formats are available for a file download or results can be sent by email. 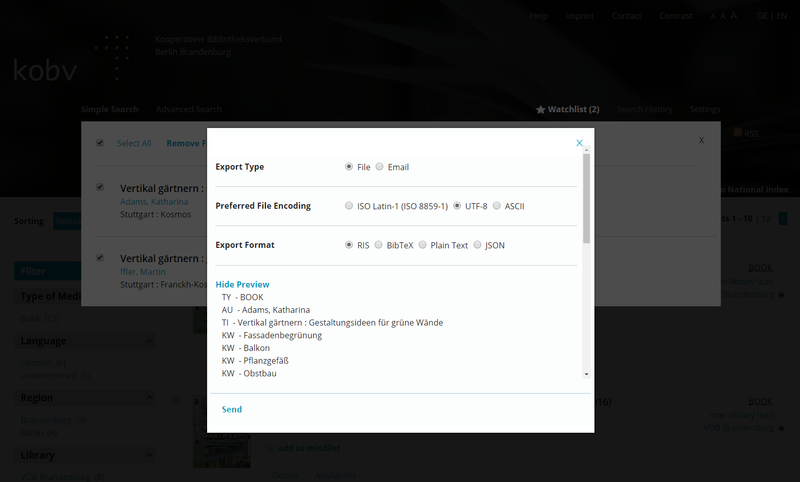 Before you export one or more titles you can preview how the bibliographic reference will look like with the chosen export format. The site also supports the COInS-Format, enabling browser plugins (such as Zotero) to automatically recognize that informations on the title are available. If you have installed such a plugin, you will see a symbol “Save in Zotero” directly after searching without having to use the “Export” function. The previous virtual catalogue “Judaica” has been integrated into the new KOBV-Portal under a facet that is called “Virtual Catalogues”, which can be found on the left side of the search result page. Currently selecting “Judaica”, will search in the collection of Judaic studies of the Berlin State Library, the University Library Potsdam, the Free University Berlin and the Jewish Museum. If the same collection is also available in other KOBV libraries, this information is also displayed. Since the 19th of June 2017 the Judaica Portal (link) is online. The portal is a joint project of the Zentrum Jüdische Studien (link) Berlin-Brandenburg in cooperation with the KOBV and libraries in Berlin and Brandenburg. It enables the direct search in the Judaica collection of the participating institutions. Other data sources that are included: RAMBI – The Index of Articles on Jewish Studies of the National Library of Israel, the digital collection Judaica of the University Library Frankfurt am Main. Further sources will be added soon. The virtual catalogue for sheet music has been discontinued. You can narrow your search to sheet music by using the “Type of Medium” facet on the left side of the search result page. To use the interlibrary loan in the KOBV-Portal a library card of a library in Berlin or Brandenburg is required. Using the interlibrary loan, a library can acquire books and journal articles for their users from other libraries in Berlin, Germany or abroad. The requirement for the interlibrary loan is always an active user account of the ordering library at the issuing library. If the ordering library offers their users an online interlibrary loan, then the user can order directly from their own workplace in the KOBV-Portal. With each interlibrary loan order, the user enters their library card number and password of their library in the interlibrary loan form. 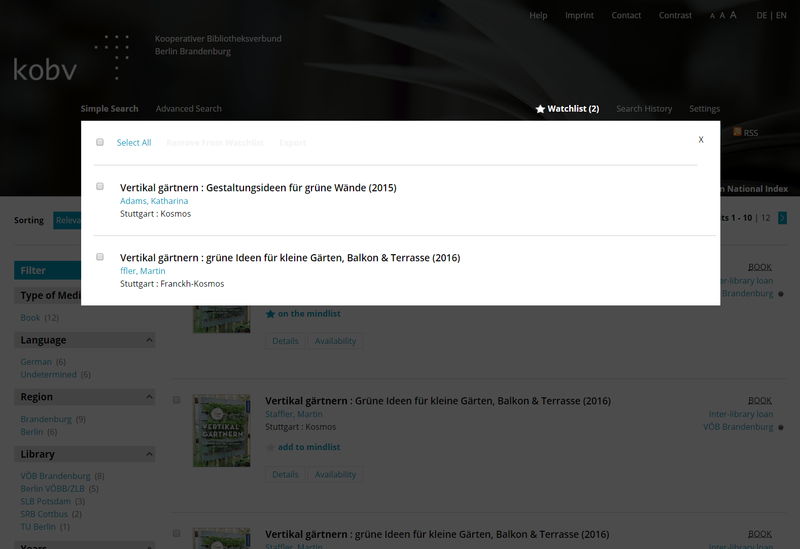 The interlibrary loan order form is only available in German. With this form you can order titles, that aren’t in your library, through interlibrary loan. Potential costs for the service will be displayed. Please make sure that the book or article isn’t available in your library. When you click on “Inter-library loan” in a search result, the information will copied into the order and you cannot change them. You have options concerning the type of order (complete work or copy of an article), the location of pickup, to what extend you are willing to accept potential extra costs, how long you are willing to wait to receive the loan, and if a different edition is acceptable. Click on “Abschicken” to finalize your order and send it to the library. You’ll receive a confirmation with the corresponding interlibrary loan number. The German National Index covers the holdings of all six library associations in Germany. The data is updated regularly. The German National Index enables the KOBV-Portal to provide an inter-regional interlibrary loan service. The naming of media types in the German National Index is different from the KOBV index. The fuzzy search (approximate string matching) is set as default for the “Simple Search” and the “Advanced Search”. In these cases, the search algorithm searches for similarities in spelling or phonetics. The results will include titles not only with exactly the sought-after term, but also results that are linked to the term by content or otherwise. As results, phonetically similar sounding words are listed. A search for the ISMN is not possible in the interlibrary loan index. Didn’t find the title you were looking for? Login to the online interlibrary loan service. You have to be a registered user at a library that is part of the KOBV, and the KOBV-Library has to participate in the online interlibrary loan service. After you are successfully logged in, an empty form will be presented to you. Please fill it out with care and as completely as possible. An interlibrary loan usually requires a fee. The amount and necessity depending on the user group is set by the library that was used to access the interlibrary loan, and can be found in their terms of service. In your own interest you should rarely use this method. The processing in the library – depending on the completeness of your data – is associated with relatively high manual effort and is not always possible in a timely manner. Since the title you are looking for is not verified by a result (meaning: Are author, title, etc. spelled correctly? or Does this title exist at all? ), the library has to verify it which delays your order. The usual online library loan form, which copies the results data, is machine readable and will be processed automatically by the library system. The empty form has to be processed in the conventional way, meaning the library has to search for the title in a database and create a manual online interlibrary loan, which also delays the process. Please know, that the rest of the KOBV homepage is in german language only. An english version is planned.